If your doctor has given you a diagnosis of lateral recess stenosis, (acronym LRS) you may be scratching your head. What in the world does this mean? To effectively unpack this term let's start at the end, with the word stenosis. Stenosis is a general medical term that means narrowing. As far as back health is concerned, it usually refers to any condition that narrows passageways through which nerves or spinal cord pass. With spinal stenosis specifically, the nerve structures have less clear space around them. Because of this, nerves may come into contact with bone, extruded disc material or other tissue, which can cause pain and other symptoms. Symptoms may include radiating lower back pain, claudication, which is a cramping that occurs when you walk, weakness, numbness and/or electrical sensations that go down one leg or arm. In some cases, more serious symptoms that disrupt bowel or bladder may occur, as well. Next, let's define "lateral recess." Many diagnoses include a reference to the location of the problem, and that's exactly what's going on when you encounter the term lateral recess stenosis. What, and Where is the Lateral Recess? Also known as Lee's entrance, the lateral recess is the space within the spinal canal that is located toward the sides. (Lateral is a medical word for "side.") Because of that, it is also located close to the spinal nerve root. Inside the spinal canal, which is the central passageway that runs the length of the spinal column, the lateral recess is defined by very specific boundaries. The lateral recess has 5 borders. First is the back of the vertebral body; while it may sound odd, the back of the vertebral body makes up the front border of the lateral recess. 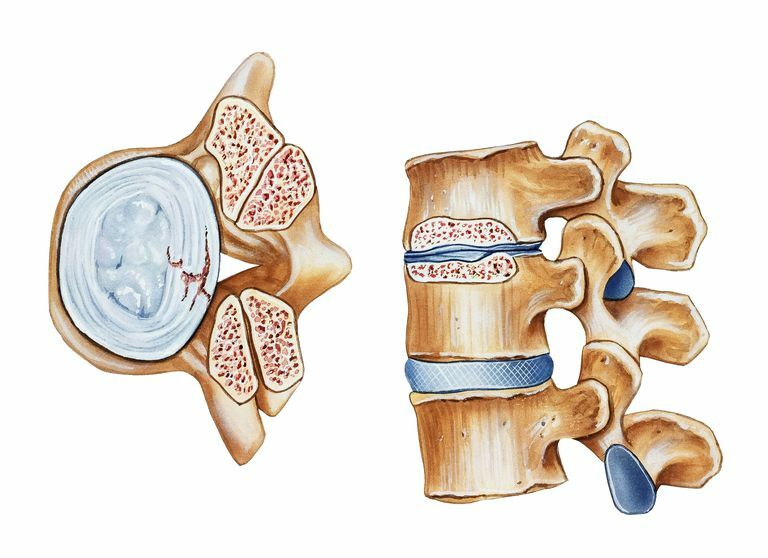 In the interest of being thorough, it's best to add the edge of the vertebral body, called the endplate margin, and the outermost part of the intervertebral disc, called the margin of the disc, to the list of structures that comprise the front of the lateral recess. The intervertebral disc is the shock absorbing cushion that is located between pairs of spinal bones. Next is the side border of the lateral recess. This boundary is made by a structure called the pedicle. The pedicle is a small piece of bone that emanates off the back of the vertebral body; it is the part of a bony ring that is closest to the vertebral body. This ring of bone is critical to many of the spine's functions. There are two pedicles at the back of each vertebral body—a right one and a left one. Past the pedicle is the lamina, which is located closer to the back of the bony ring than to the vertebral body. As you will see, the junction between the pedicle and the lamina is critical in defining the side boundary of the lateral recess. This is because other small pieces of bone that help to either delineate the borders, or at least aid in our ability to accurately visualize the area, stem from this junction. These small, emanating pieces of bone are generally called processes, and each has its own unique identifying name, as well. For example, near the pedicle, the transverse processes extend out horizontally on either side and provide sites for muscles and ligaments to attach. The transverse processes are also the places on the spinal bones in your thoracic area that connect to ribs. The pedicles make for great landmarks when looking at an image of a spinal bone and trying to determine what's what. As far as the transverse processes go, the pedicle is located in front, and the lamina is located in the back. Other pieces of bone that emanate from the area between the pedicle and lamina are the articular processes. Articular processes from one spinal bone interdigitate with articular processes of the next, both above and below, forming the facet joint. Altogether, facet joints give the spinal column much of its stability. One of those particular processes—the superior (superior means above in medicalese) provides part of the back border of the lateral recess. The other part of the back border of the lateral recess is provided the ligamentum flavum. Of the numerous ligaments attached to the spine, the ligamentum flavum is the one that connects vertically between the lamina of the spinal bones on the inside of the spinal canal. The job of the ligamentum flavum is to protect you from disc injury; it does so by keeping you from bending too far forward. Let's put it all together now. As you've seen, the lateral recess is a part of the spinal canal and may be vulnerable to spinal stenosis. Age-related changes in bones, facet joints (which are constructed of the articular processes mentioned above) and/or ligaments might cause these structures to in some way occupy, and therefore narrow, space we call the lateral recess, as well as the other passageways made by interconnecting spinal bones. And due to their proximity, these imposing (and generally abnormal) tissues may “bump into” the nearby spinal nerve root and/or spinal cord that normally pass through the lateral recess unimpeded. This is called encroachment or impingement. When encroachment occurs, it may cause pronounced pain and other symptoms. Because the lateral recess is part of the spinal canal, when stenosis develops there, it is categorized as a central canal stenosis which is stenosis occurring in the canal. In this case, myelopathy symptoms may ensue. Myelopathy symptoms result from irritation or compression of the spinal cord. As an example, the development of lateral recess stenosis may occur when age related changes in the ligamentum flavum occurs. Such changes may include thickening, loss of strength, and loss elasticity to the point where a buckling towards the inside of the spinal canal occurs. And of course, a thickened ligamentum flavum creates a narrower spinal canal—the hallmark sign of central canal stenosis. If the buckling impinges on the spinal cord, it may cause myelopathy symptoms. Park, J., Lee, J., Park, S., Riew, K. Hypertrophy of ligamentum flavum in lumbar spinal stenosis associated with increased proteinase inhibitor concentration. J Bone Joint Surg Am. Dec 2005.